Badami is truly famous for its Cave Temples that date back to the 6th and 7th centuries. 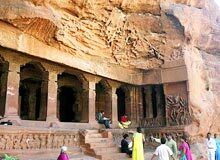 Located at Badami in Bagalkot district of Karnataka, Cave Temples represent the fine architectural style of the ancient times. The nearest airport to Badami is located in Belgaum. Belgaum lies at a distance of 150 kms from Badami and one can easily reach the cave temples by hiring taxis. Various tourist buses and coaches are also available throughout the state of Karnataka. Badami is sited at the orifice of a gorge that is fringed by two rocky hills.